The former Union minister said the secular fabric of the country was "under attack", adding that the incidents of barbarism had highlighted the need for the minorities to unite. 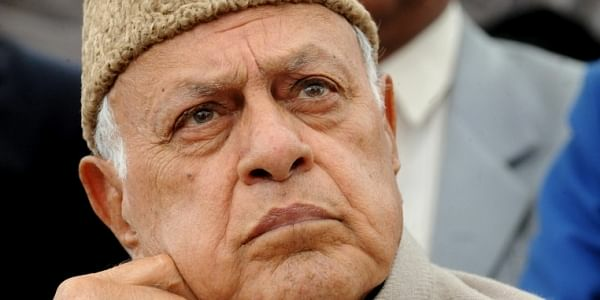 SRINAGAR: National Conference (NC) president Farooq Abdullah today said the secular fabric of the country was being "eroded by the repeated and unabated" incidents of violence against the minorities. "The barbaric and horrific attacks on individuals in various parts of the country indicate towards a patronage to a communal and disruptive mindset that threatens to harm the very ideals of the Constitution and democratic republic," he said while addressing a minorities' rally at Tumkur in Karnataka. The former Union minister said the secular fabric of the country was "under attack", adding that the "repeated hair- raising" incidents of barbarism had highlighted the need for the minorities to unite in their efforts to protect the secular and democratic ideals of the Constitution. "The minorities are living under an atmosphere of fear and anxiety as various state governments and the Centre have tragically failed to speak unequivocally on this issue. "A decisive and exemplary punishment in such cases is missing and this is encouraging the communal elements in their nefarious designs," he said. Speaking on the occasion, former prime minister H D Deve Gowda highlighted the need to protect the rights and honour of the minorities and said the BJP-led central government was obligated to ensure that all the minority communities felt safe and protected in every state. Talking about the need to find a permanent solution to the political issue in Jammu and Kashmir, he said when he was the prime minister, the government was keen on restoring autonomy to the state and that it was important to take concrete measures in that direction. Deve Gowda said it was imperative to win the hearts and minds of the people of Jammu and Kashmir with an aim to sustain peace and harmony in the region. Abdullah thanked Gowda for his support and empathy for the people of Jammu and Kashmir and said the stakeholders all across the country should unite and evolve a consensus to resolve the Kashmir issue, as per the aspirations and sentiments of the people of the state. "It is important to address the political sentiment in Jammu and Kashmir and in that direction, a political consensus at the national level is crucial. "New Delhi cannot avoid talking to Pakistan for resolving the Kashmir issue and it should also talk to all shades of opinion in the state with a sincerity of purpose and utmost seriousness," the former Jammu and Kashmir chief minister said.